Tucked away in a converted warehouse space in Garden City, creativity is flowing from the newest home of Fawn and Foal. For nearly 10 years, their Idaho apparel has successfully captured the playful and positive voice that is Boise, Idaho. On this particular evening, a photo shoot is taking place for their new website. Music and warm light emit from outside the shop’s metal roll-up door. Inside, boxes of pizza are stacked on tables with beers and paper plates next to them. A group of friends waste no time gathering around a worktable of clothing separated by size and color. They begin layering t-shirts, sweatshirts and hats, pausing to turn up the music or strike ridiculous poses in front of the painted drop cloth. The photographer eggs them on, dancing to the beat. In the center of the excitement, owner and artist Juliana McLenna grabs a slice of pizza while her family dog Eugene weaves in and out of her feet. Her two kids, busy with a project of their own, occasionally jump in for a photo and then run away, overcome with giggles. The effortlessness to which Juliana orchestrates a night like this is a testament to Fawn and Foal’s success. The seamless way a business can invite play and collaboration in combination with kids and creativity, appears to come easily to their brand. However, when looking back on the different forms of Fawn and Foal, it has been a 10 year-long adventure to find their sweet spot. Fawn and Foal began with husband and wife duo Juliana and Ben McLenna’s journey to find each other. Their travels before meeting took them everywhere from New Orleans to Utah, Africa and Paris before they eventually fell in love in Texas. A few moves later, and more wonderful homes to add to their list, the two returned to Boise, Idaho. 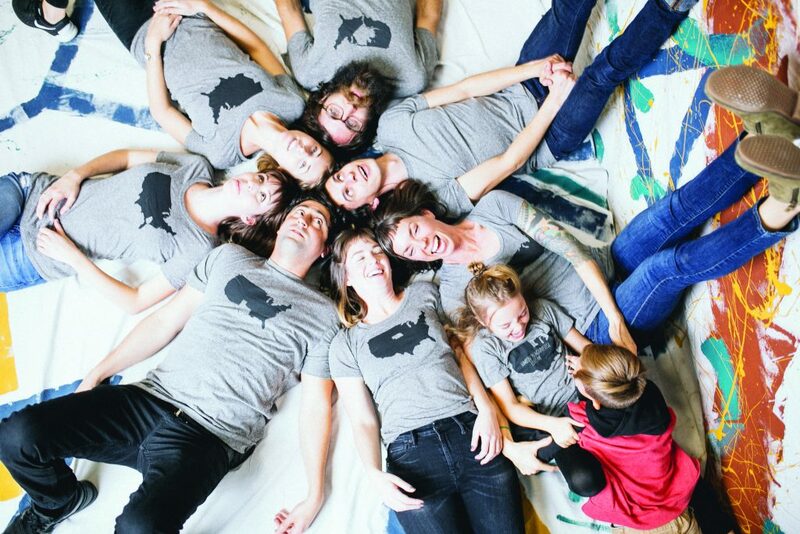 The significance of their journey became even more solidified as Fawn and Foal made the decision to expand their line of “someone loves me” shirts for every state on the map. Now they are spreading the love, literally. Maybe this is why the hand-printed clothing still feels so authentic to their wearers. It’s also why the brand naturally cultivates dialogue. Their Instagram account is filled with images from other families’ repping their own state. Their website has an “about you” section to learn more about where people are calling home and why. So, if you’re suddenly feeling inspired to have a fun photo shoot of your own, share your pics with the Fawn and Foal team. Or, if you want to tell them about a state you love or a person you love, send them a note about your “someone” and keep the creativity flowing.